A 16-year-old girl presented with a 6-month history of intermittent dry cough. For the 2 weeks prior to hospitalization, the patient had tactile fevers, right-sided chest pain, increasing wheezing, and fatigue. 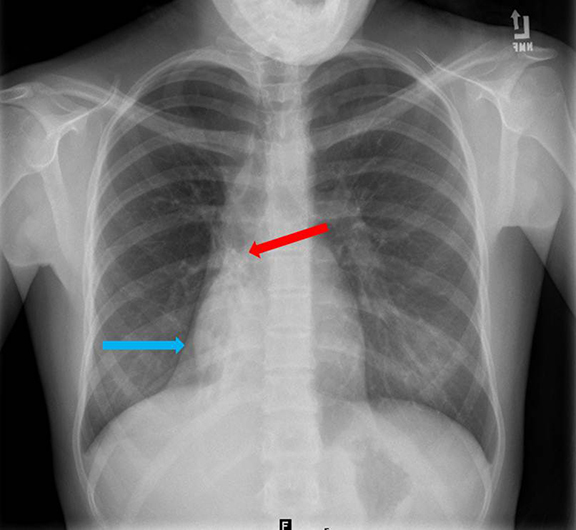 A chest radiograph (Figure 1) demonstrated right lower lobe collapse with air bronchograms. 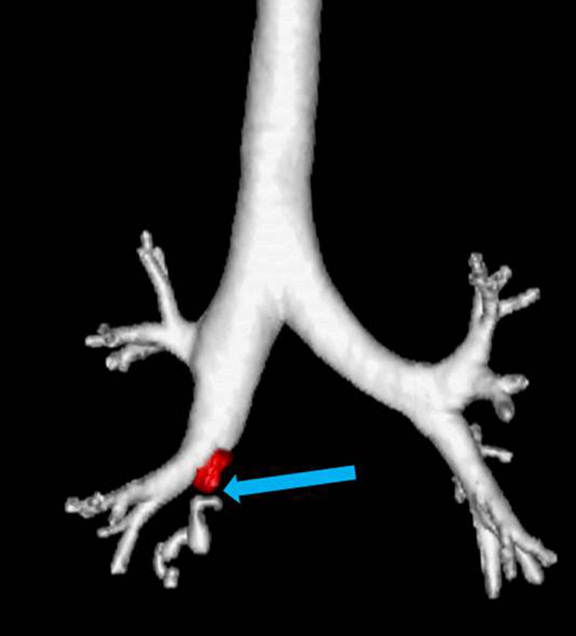 Contrast-enhanced chest CT scans (Figures 2-4) demonstrated an enhancing hypervascular endobronchial lesion within the bronchus intermedius. There was marked right lower-lobe volume loss with cylindrical bronchiectasis and mucus filling of some of the dilated bronchi. 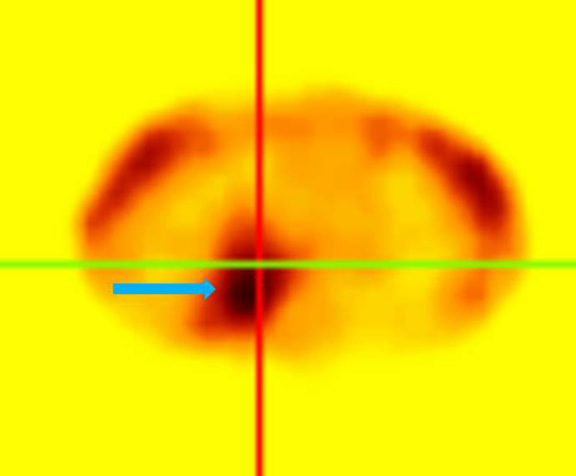 A 24-hour SPECT image from an Octreotide scan (Figure 5) showed increased radiotracer uptake within the right chest in the region of the hypervascular endobronchial lesion. Differential Diagnoses: Carcinoid, aspirated foreign body, laryngotracheal papillomatosis, pulmonary hamartoma, and fibroepithelial polyp. Overall prognosis is good with a 10-yr survival rate of 88%. Prognosis is highly dependent on tumor grade, with atypical carcinoid 10-yr survival rate dropping to 24-52%.6,7 Treatment is surgical. 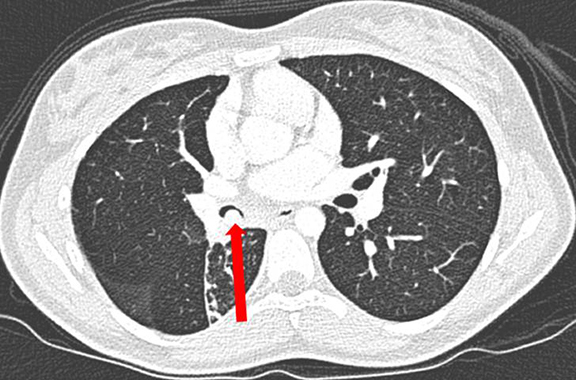 Endobronchial carcinoid is the most common primary pulmonary neoplasm in the pediatric population. 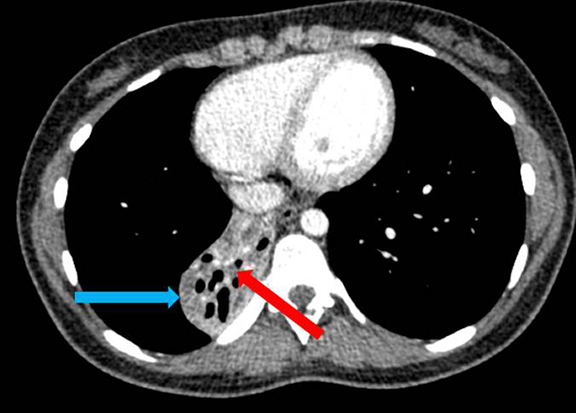 On contrast-enhanced CT, the tumor is characteristically an enhancing mass with eccentric calcifications located within the central airway tree. 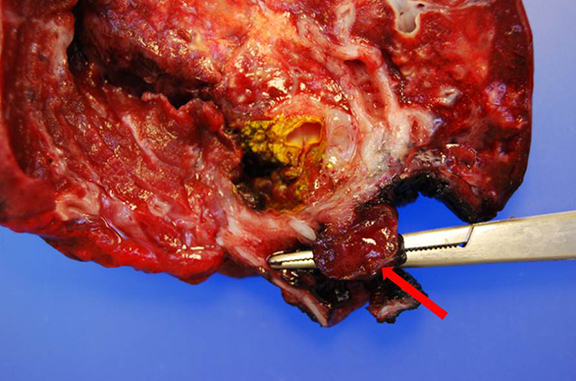 It is important to look for metastatic disease as treatment is surgical resection. Jeung M, Gasser B, Gangi A et al. 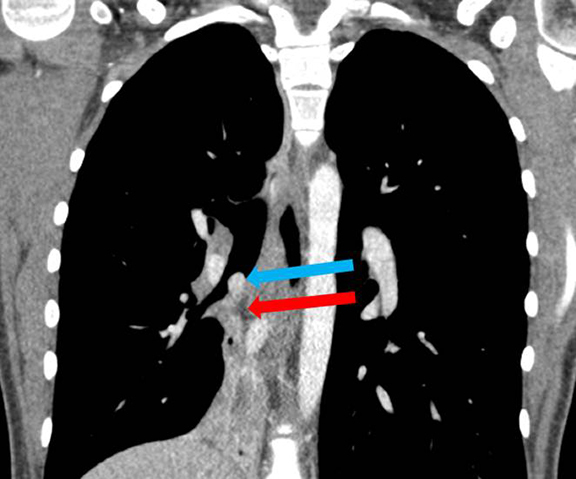 Bronchial carcinoid tumors of the thorax: Spectrum of radiologic findings. Radiographics. 2002; 22:351-365. Wang L, Wilkins E, Bode H. Bronchial carcinoid tumors in pediatric patients. Chest.1993;103:1426-1428. Ducrocq X, Thomas P, Massard G, et al. Operative risk and prognostic factors of typical bronchial carcinoid tumors. Ann Thoracic Surg. 1998; 65:1410–1414. Melmon KL, Sjoersma A, Mason DT. Distinctive clinical and therapeutic aspects of the syndrome associated with bronchial carcinoid tumors. Am J Med. 1965;39:568–581. Dusmet ME, McKneally MF. Pulmonary and thymic carcinoid tumors. World J Surg. 1996;20:189–195. Ducrocq X, Thomas P, Massard G, et al. Operative risk and prognostic factors of typical bronchial carcinoid tumors. Ann Thoracic Surg. 1998;65:1410–1414. Martini N, Zaman MB, Bain MS, et al. Treatment and prognosis in bronchial carcinoids involving regional lymph nodes. 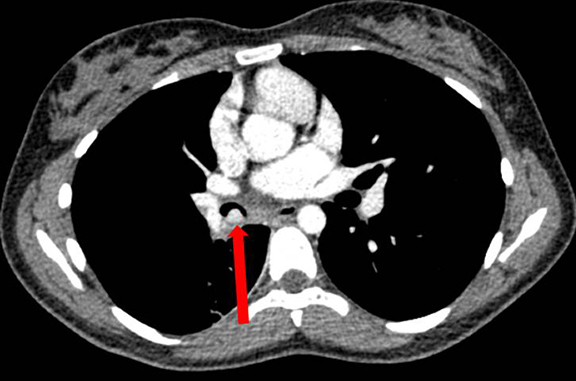 J Thoracic Cardiovasc Surg.1994;107:1–7. Prepared by Dr. Constantino, Dr. Patel, Dr. Jorgensen and Dr. Richard Towbin while practicing in the Diagnostic and Interventional Radiology Department, Phoenix Children’s Hospital, Phoenix, AZ; Dr. Alexander Towbin while practicing in the Department of Radiology, Cincinnati Children’s Hospital, Cincinnati, OH; and Dr. Dickman while practicing in the Department of Pathology, Phoenix Children’s Hospital.